I vividly remember harassing my mother throughout my childhood about her obsession with tea, because at the time I personally didn’t have a taste for it. Years later, I now understand why she hurriedly put the kettle on; the ritual performance of preparing a cup, the warm comfort of a fresh cup in your hand and the slice of time dedicated to sipping, reflecting and relaxing. Tea is something that I now look forward to enjoying daily. (Sorry mom: I hope this post makes up for my naive mockery of tea when I was younger). If I were to guess what turned me onto tea, I’d most likely put it hand in hand with my discovery of sushi and Japanese cuisine. There was a little sushi place down the hill from where I studied my BFA, and I used to go weekly for lunch where avocado rolls, miso soup and green tea were staples. Half a decade later, teas frequent my refreshment zone on the regular. Green teas are still my favorite, but I am also a sucker for anything infused with fruit. The rare time I’ll enjoy a cup of chai or black tea, but they have to be heavy with milk and sugar. White teas have been a fun new discovery, and if someone tells me that I “have to” try a tea, I will. I can’t help but think that teas are like wines: taste tests are essentially limitless… Call me a tea lush. Having my best friend move in with my fiance and I several months ago has done nothing but increase my tea intake: we will boil water several times a day and steep cup after cup. At the beginning of December we decided to get all posh and treated ourselves to a selection of loose leaf teas from David’s Tea. After scouring their awesome website, Pineapple Oolong, Guava Cadabra, Coco Chai Rooibos and Goji Pop were carefully selected. They’ve all been sampled. They are all AMAZING. 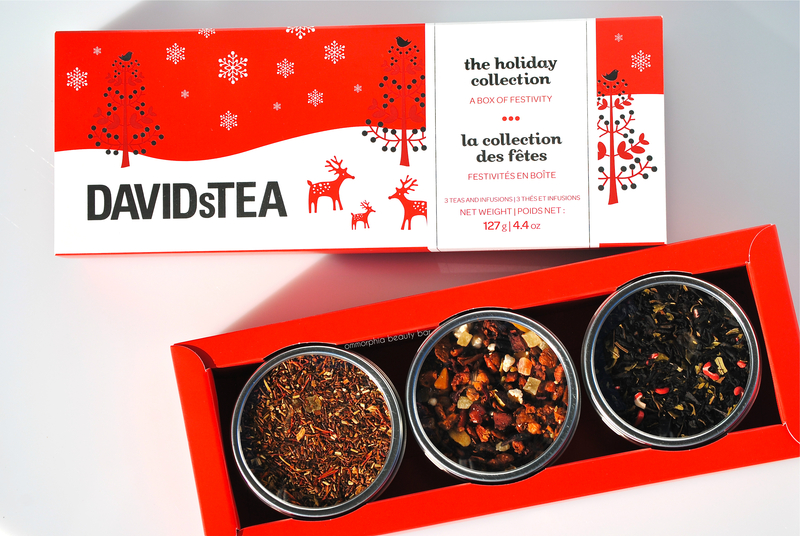 Christmas gifts further fueled my tea obsession when both my sister and sister-in-law each treated me to David’s Tea Trio’s: The Green Collection, and the Holiday Collection! Spoiled. We have since set up a tea station: large mugs, ceramic birch spoon, sugar bowl and 3 cup teapot are all at the ready and waiting. Loose leaf teas are stored in large and small tins, while bagged teas are in the ceramic deer jar. Put the kettle on and help yourself! Do you drink tea? What are some of your favorites? Do you prefer it black or do you add something to it? Let’s talk tea, leave your comments below. It is inevitable: when either the spring or winter craft show season hits, I get a little frantic and manic… SO MUCH TO DO, WHERE DO I START, THERE IS NO TIME, AHH. I always get things done, and somehow on time, but I often am a frazzled puddle of a person afterwards. Being a business owner (especially a flying solo business person) you end up wearing many hats and doing many things that it is just so easy to end up exhausted. This year I am trying to be different in my approach: I am planning further ahead and am starting to get the hang of these big shows… but something else I’m doing is making a conscious effort towards finding (or making) time for MYSELF. It could be as simple as a relaxing hot shower before bed, a calm yoga stretch session, a little walk around the block, sipping a cup of tea, etc… but let me tell you, these simple things do wonders for the mind, body and soul. My friend Valerie shared this link the other day, and it is right in tune with the mantra I am trying to keep up. The shared post lists 55 ways to gently take care of yourself. We all need to do more of this, so why not try 1 of the 55 today?